Armed with a healthy supply of Cliff Bars, two big bottles of water and a map of Jamaica, we stepped out of the Montego Bay airport. 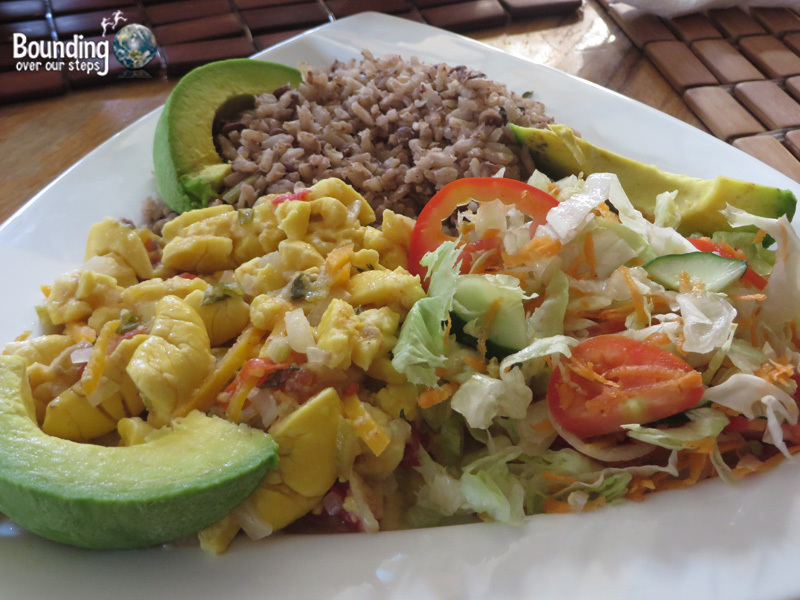 We quickly realized that being vegan in Jamaica would be fairly easy. Happy Cow, our go-to website for locating vegan restaurants around the world, informed us of dozens of vegan restaurants on the island with most centering around Negril, Montego Bay and Kingston. With accommodations in Boscobel (St. Mary’s Parish), we opted to spend our meals in neighboring Ocho Rios where they had a large fruit market as well as several vegan restaurants. With a temperate climate all year round, fresh fruit can be found everywhere in Jamaica: in grocery stores, at outdoor markets, fruit stands on the side of the road and even right off the trees. Perhaps the most recognizable fruit in Jamaica is the mango, however. You will find many kinds of mangos at the markets, with the most popular being perhaps the Julie mango and the Number 11. If you’re not sure which kind of mango you’re buying, not to worry because you really can’t go wrong with any kind, since they are all delicious and most likely sweeter than what you may be used to. We also came across naseberries, which are oval-shaped, brown on the outside with flesh and taste sweet, Jamaican rose apples, which were very similar to the rose apples we had in Thailand except that these had a pit inside, breadfruit, sour sops, sweet sops (similiar to a custard apple), bananas, plaintains, guava, June plums and Jamaican pears, which we quickly discovered are avocados. 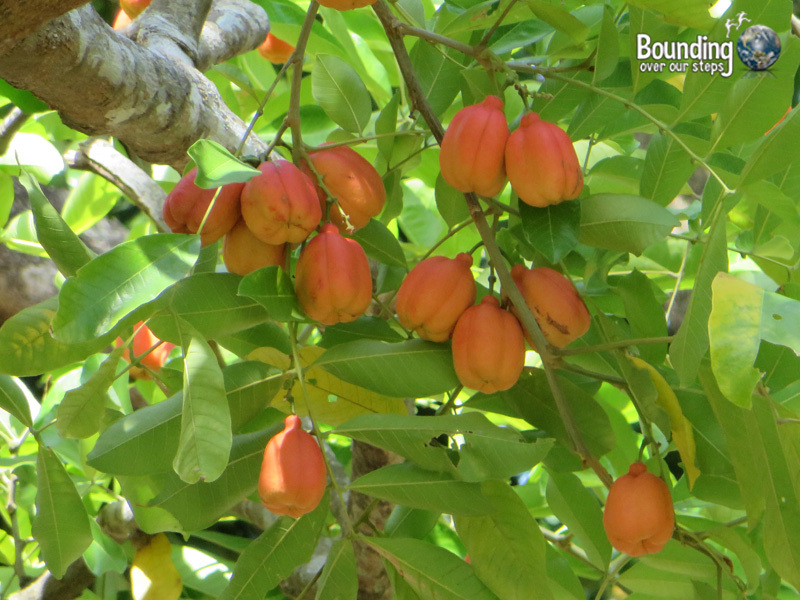 One of the most interesting fruits we came across was the ackee fruit, which is bright orange/pink on the outside and white on the inside with brown seeds. Although these grew on the tree in the back of our accommodation, we did not dare pick them as we were told that if harvested too early, they are poisonous. So we left that up to the experts. 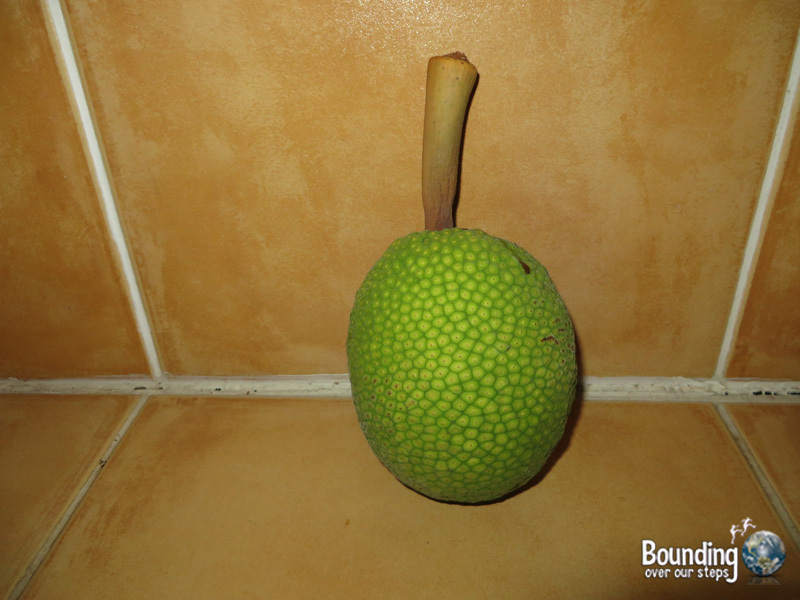 A breadfruit tree, as well as a Julie mango tree, were also in the yard of the house where we were staying. Henry, the friendly gardener, picked some of the mangos for us, which we enjoyed immediately, and when we found a freshly fallen breadfruit on the ground, he explained how to cook it: if we boiled it, it would taste like potato and if we roasted it, it would taste like bread. I know that if we stayed longer in Jamaica, we would have discovered even more fruits that were both delicious and new to us. Ital food, pronounced “EYE-tahl”, is associated with Rastafarians, who stick to this mostly vegan diet in order to increase levity, the life energy that lives within all human beings. Ital food is made from ingredients that are natural, pure and from the earth, avoiding food which is chemically modified or contains additives. To that end many Rastafari do not eat food which has been treated with pesticides and will often grow their own food. 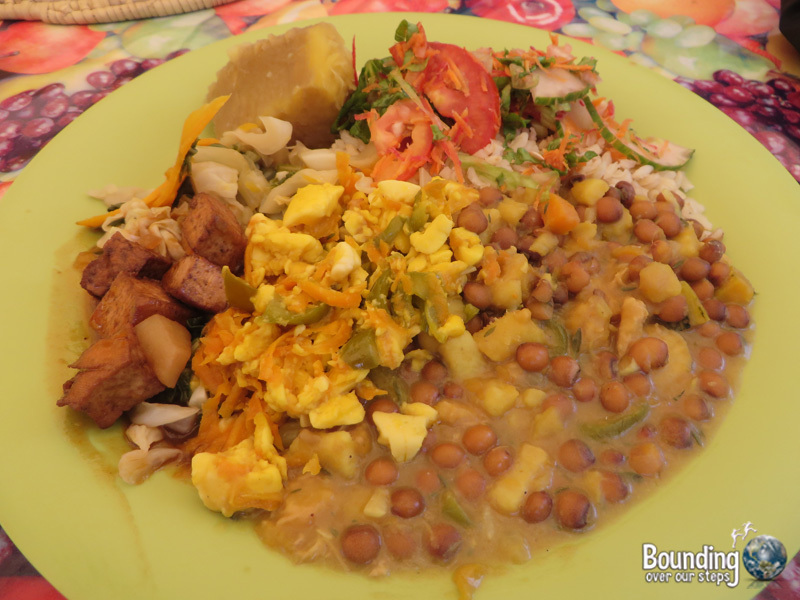 Common ingredients in ital food include ackee fruit, breadfruit, carrots, potatoes (they call them Irish potatoes), various kinds of beans, yams and greens such as collards. With the exception of honey, which was often included in the marinade of some of the tofu dishes as well as the main sweetener in desserts, ital food was synonomous with veganism so we visited every ital restaurant in Ocho Rios at least once and ate ital for lunch and dinner every day during our stay. The first restaurant we tried was Calabash on James Street on the second floor on the right side of the road if coming from Main Street. There are a few parking spots in front on the building and if they are full, there are spaces just beyond the restaurant on James Street. Deli, the main chef, happily explained the items that were new for us on the menu, such as ackee and sips (which is soup). We ordered a large plate of a mixture of dishes as well as a sip. We spent much of our time at Reggae Pot at 88 Main Street, which has a parking lot just in front as well as several tables outside. 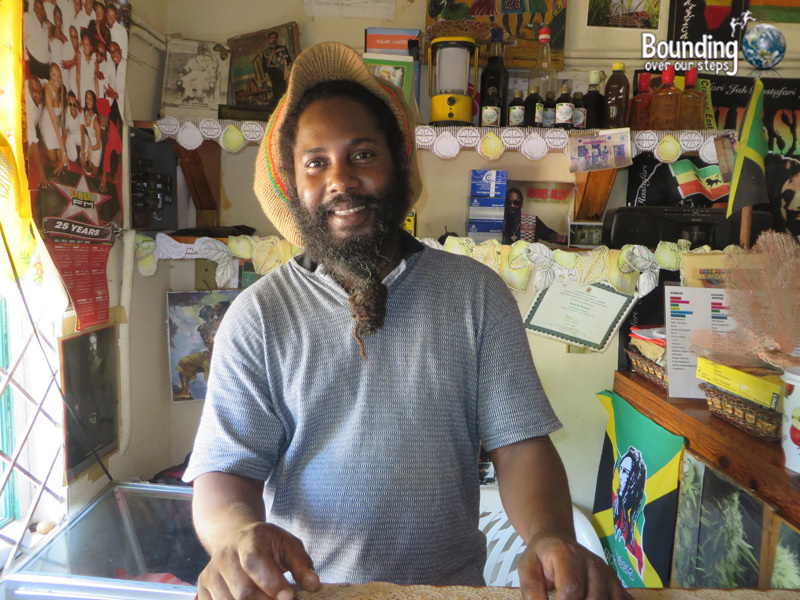 Daeni, the main chef and owner, was very willing to share information about the Rastafarian religion as well as his recipes. One of my favorite dishes at Reggae Pot was the black-eyed peas. We met some of the friendliest people at Kai Fi Restaurant in the Simmons Square off Main Street, to the left of the Simmons Hardware Store. 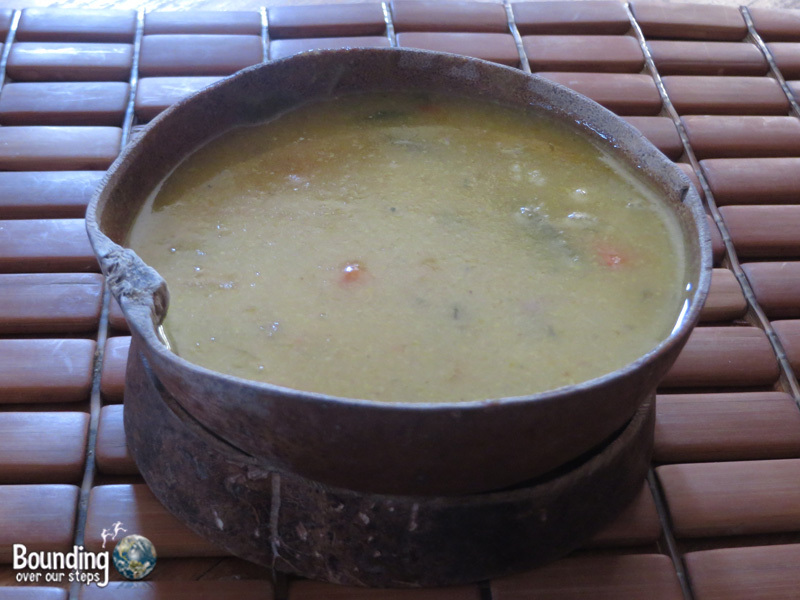 Since October 2014, Joseph and Pam have prepared ital food for the community. Their menu changes daily and they had the best presentation of any restaurant we visited. 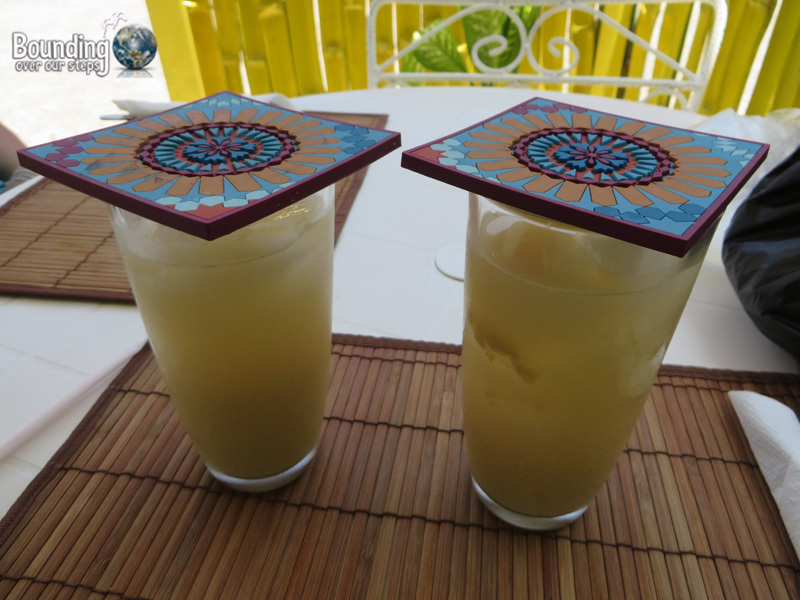 This is also where we enjoyed the June plum, guava and ginger juice pictured above. When Mindy wasn’t feeling well one day, we stumbled upon a sign simply stating Vegetarian Restaurant just off Main street on the left hand side of the General Foods Plaza. We had just eaten so we didn’t stay for a meal, but the menu looked delicious, including porridge and even a veggie burger with or without vegan cheese. 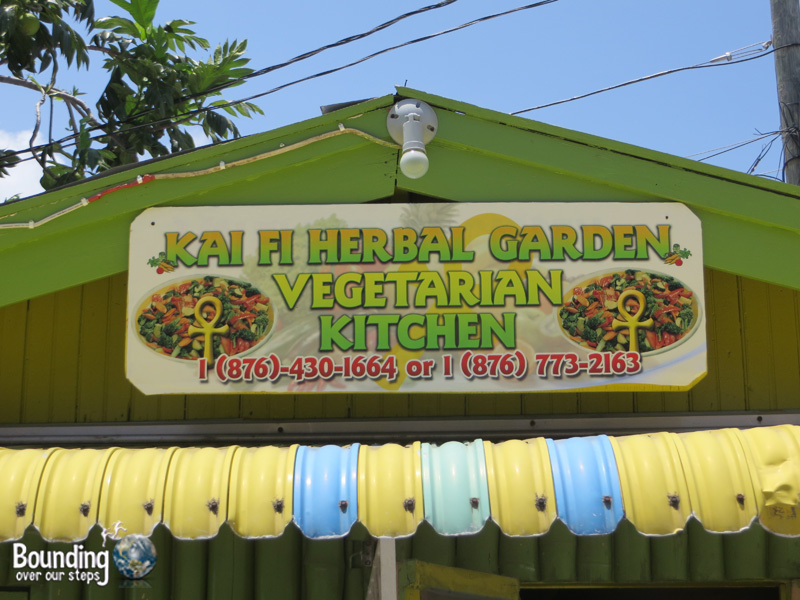 They also sell herbs and have vast knowledge about herbal medicine so if you’re not feeling well during your trip, head to this restaurant and they will cure what ails you. Outside the world of ital not everyone was familiar with the term vegan, often confusing it with vegetarian and even pescatarian. It is worth clearing up the concept before ordering in any Jamaican restaurant to be sure you are getting what you want. Even vegan restaurant employees often use vegetarian and vegan interchangeably. Have you ever been to Jamaica? What vegan food did you enjoy? Sounds wonderful. This reminds me of a great vegan restaurant I found in London that was owned by a couple from Jamaica, it was called Calabash of Culture. Since visiting Jamaica I have tried to recreate Ital food back home, but have failed miserably. I think I am really missing the ackee fruit which was part of almost every meal. 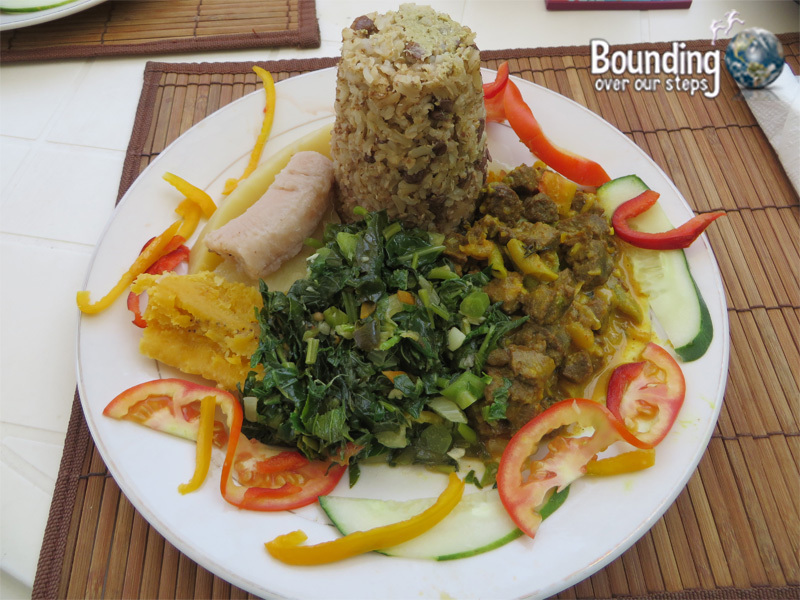 Vegan food in Jamaica exceeded all my expectations! Thank you for the write up. We will be visiting Jamaica in a few weeks and the information you shared will be a handy guide. Thanks again!